Pizzability is serving up a slice of community right alongside its hand-tossed pizzas and craft beer, creating a space where everyone is welcome to enjoy a meal together. Tiffany Fixter (center) created Pizzability for individuals with intellectual and developmental disabilities to learn skills and job training. From left: Chef Bryce Love, Tony Saponaro, Tiffany Fixter, Yanelly Oretega and Andy Ngovanduc. Owner Tiffany Fixter’s mission for the restaurant, which opened in December, is not only to create employment opportunities for adults with intellectual and developmental disabilities (IDD); she also wants to give Denver area families with special needs children or adults an inclusive restaurant option that accepts and supports people of all abilities. After teaching special education for 11 years, Fixter knew she could do more to help an often-overlooked population gain skills training that can lead to meaningful work. In 2016, she opened Brewability Lab, Denver’s first and only brewery focused on employing and training adults with IDD for job opportunities in the beer business. Then last spring, she heard a local pizzeria was closing, so she jumped at the opportunity to grow the business. Pizzability employees have a wide range of differing abilities. Between the brewery and the pizzeria, Fixter says many of her employees have autism spectrum disorders. She also has one who is deaf, one who is blind, and others with Down Syndrome and cerebral palsy. Bryce Love (right) shows Andy Ngovanduc how to serve up pizza. 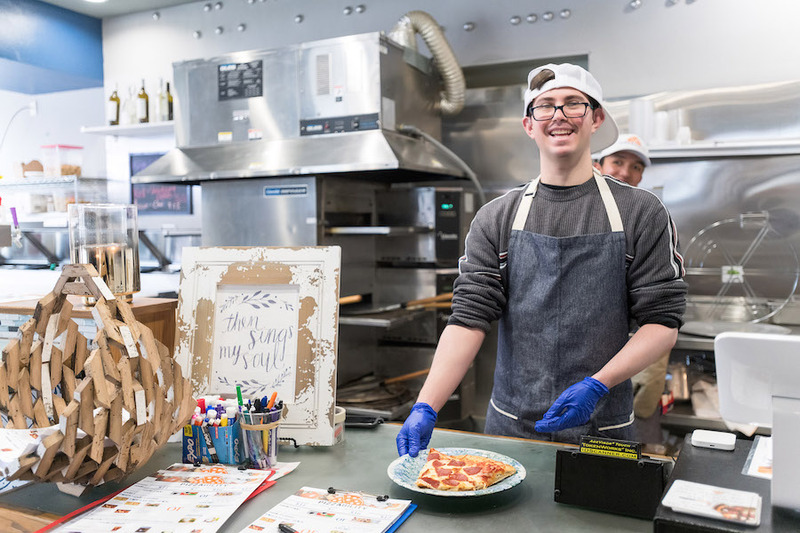 Aside from some funding from the Rocky Mountain Human Services’ mill levy program that was put toward the initial renovation of the space, Pizzability is funded entirely by customers. And at such affordable prices (during happy hour, which runs 2-5pm Tuesday through Saturday, pizza is $2 a slice and a glass of Brewability beer or wine is $5), keeping afloat is a challenge, but one Fixter believes is well worth it. Five days per week, Chef Bryce Love is in the kitchen giving employees hands-on support, making sure everyone understands everything from how to get ready for work to the importance of following processes to ensure food safety. 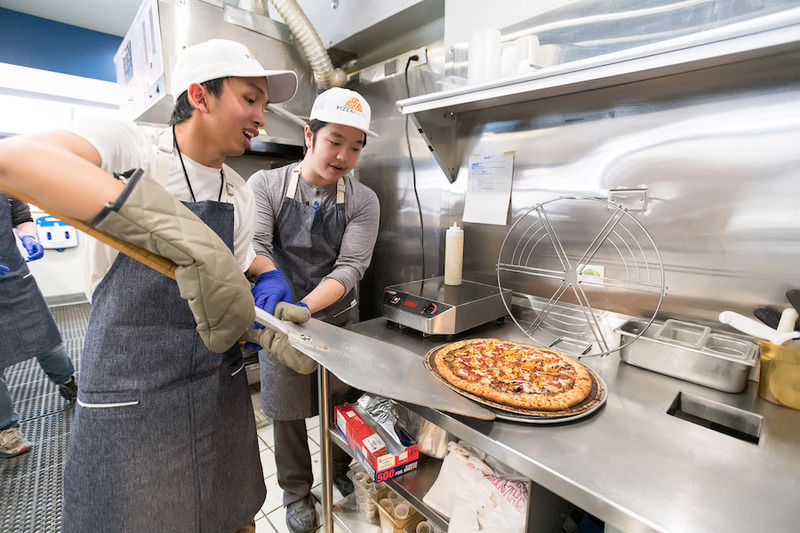 Recently, ESPN featured the pizzeria in celebration of the 50th anniversary of Special Olympics, recognizing Pizzability as one of 50 “game changers” that is changing the way the world views disability. 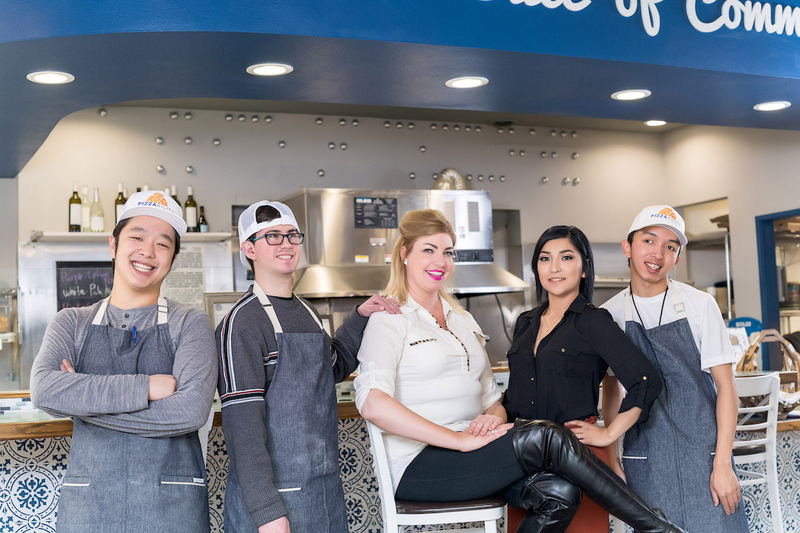 To continue her mission to change the game, Fixter is working on setting up delivery and catering services within Cherry Creek. She’s also looking forward to summer, as she plans to open up the restaurant’s garage door to allow guests to enjoy the outdoor seating. Tony Saponaro, who also works at Brewability, says he loves to meet new people and come up with new ideas for pizza topping combinations. When guests step up to Pizzability’s counter, they are greeted with a visual menu, which is also available in braille. The restaurant offers mostly classic toppings like pepperoni, supreme and Hawaiian, which are also available on gluten-sensitive crust. Fixter says they’re happy to blend the pizzas for anyone who has trouble swallowing or chewing. She also stocks adaptive utensils, cups and plates—there’s a visual menu board that includes all of these items at the counter, and guests can request whatever they need. A sensory corner with noise-cancelling headphones, board games, and an interactive light up wall was created with help from PIMA Medical Institute students. “It’s for anybody that needs to move and fidget,” she explains. There’s also a quiet room in the back that allows employees to take a break away from the noise, which helps reduce any stress and anxiety that can be overwhelming for people with certain disabilities. Even the bathroom is stocked with personal care items to ensure accidents won’t disrupt a pizza party. Additionally, Pizzability has free parking behind the restaurant and is ADA accessible from both the street and the parking lot.